This beta fixes some idiosyncrasies with lists that were introduced in the previous release. There are also five new features. *Note that in this beta we specify angles in radians – this is an oversight, and will be changed to degrees in the next release. Obviously this example is more exciting if the buttons have text or custom skin images. There’s a change to the <image> component that allows you to specify data for different screen pixel densities, in the same way as the <tabPages> and <icons> components. Although the <imageX> component allows you to accomplish this in a different way, <image> is now more consistent with other components. Hence <imageX> is depreciated now. The <labelFTE> component is like the <label> component, but it utilises the Flash Text Engine. The XML attributes match the properties of the flash.text.engine.ElementFormat and import flash.text.engine.FontDescription classes. There’s also a leading and a rightToLeft attribute. Please blog and tweet about this project (#MadComponents) and help to spread the word. Also, don’t forget to leave a “star”, or “g + 1″ recommendation on the Google Code site. Also, help promote the new Github repository. For every Adobe-endorsed AS3 Framework, there tends to be at least one non-endorsed AS3 Framework that is much better in some ways. Diversity is a good thing. So, Adobe endorsement is a mixed blessing. On the one hand, it’s great that Adobe takes frameworks that have been incubated by the community – and injects money, publicity, and surrogate credibility. On the other hand – exclusivity is bad for the AS3 community, and it stifles innovation and advancement. Adobe only shines its spotlight on ONE framework in each category. Everything else is cast into the shadows. Developers naively assume that Adobe-endorsement means that the Adobe-endorsed framework will do everything better than the non-endorsed framework. So when the Adobe-endorsed framework fails to deliver – that developer will look elsewhere. They’ll jump the fence to HTML5, Unity3D, Corona, etc, rather than consider fantastic non-endosed AS3 Frameworks. 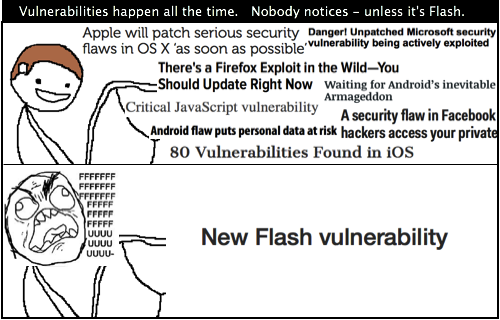 I know that this has happened, and that the Flash Platform has needlessly lost credibility and developers to the competition. Adobe supports three significant AS3 frameworks, for three significant use-cases. Away3D for 3D animation. Starling for 2D animation. And Feathers for UI Form-based apps. For each of these use-cases, there are amazing non-endorsed frameworks. Zest3D, and Flare3D for 3D animation. Genome2D, and ND2Dx for 2D animation. MadComponents for UI Form-based apps. There is no silver bullet. The best framework for one project, may not be the best for another. In some respects, Adobe-endorsed frameworks are better. In other ways, non-endorsed framework are better. It will all depend on the requirements of the application. For example, Away3D is well-known and mature. But Zest3D performs better on devices. Adobe endorsement of Starling has created tremendous interest. But Genome2D performs better. Feathers allows for smoother page transitions, and list scrolling. Also Feathers mixes well with Starling. But MadComponents is better with pixel-snapped images, embedded fonts, ease of adding customised components, a faster start-up time, and it has many more components, including the most performant mobile-optimised datagrids of any AS3 UI Framework. I’m not trying to discredit the Adobe-endorsed frameworks, or their developers. But I have a lot more respect for the developers of non-endorsed frameworks, for their tenacity, ingenuity, and dedication, despite being cast into the shadows. I just wish there was more discussion about the relative merits of both Adobe-endorsed and non-endorsed frameworks. I wish the authors of the Adobe-endorsed frameworks would shed more light on the alternatives, rather than silently reinforcing a misconception of theirs is the only AS3 way to do the job. Actually, there is just one previously Adobe-endorsed framework that I would remove from the face of the planet if I had the chance. The inadequacy of Adobe Flex for Mobile (now Apache Flex) has done a lot of damage to the credibility of Adobe AIR on devices. I was interested to read that Josh Tynjala plans to incorporate MXML layouts to Feathers. He is looking for corporate sponsorship. Or he may consider Kickstarter funding. The above layout would generate tab buttons at the bottom of the page. And those buttons are wired-up to work, without any additional code. Later, we will see how we can even define labels and icons as XML data. If we want to build universal apps. Or if we want to cater for devices with very small screens (240×320). Or even if we want different layouts for portrait and landscape orientation – then our XML layout language should deal with alternative layouts for different size dimensions. For more information about the screens tag, see here. The model tag enables communication with a server. It handles retrieval of JSON, XML, or AMF data, parsing, and deriving the data for a form or list. The entire example that this code snippet comes from can be found here. An XML UI layout saves you a lot of time, effort, and coding when developing an application. This is because a powerful XML UI layout language will replace a lot of code. Not only does the layout replace the code to render a UI to the target device screen size. It also handles orientation change. And we’ve seen how aspects of the layout language can also replace the code to navigate an app, custom renderers, managing resources to match screen pixel density, layouts for different screen sizes and orientations, server communication, and many more capabilities. So XML Layouts for Feathers are definitely a good idea. The long-awaited milestone release is out now! MadComponents 0.8 / ExtendedMadness 0.3 includes more datagrids, tables, faster custom list renderer, and better support for images matched to screen density. The source code is still hosted on GoogleCode. But since, the .swc libraries can’t be downloaded from there, we’re hosting on Github too. The .swc libraries can be downloaded from Github. In the previous part of this blog post, we described five new features in the MadComponents beta release. In this second part, we’ll describe five remaining new features. Most new features are refinements on existing components. The beta is available on the MadComponents FaceBook Group to download and try now. (See in pinned thread – the beta is included in the 0.79/0.21 folder). Please try it out – and report any problems. There’s a lot of new stuff – so I’d appreciate any help ensuring that all the old functionality is still ok – and all the new stuff works as advertised. 6. UIIcons improvements: The new scheme for specifying images and labels in the XML layout, and different resolution images for different density screens, may also be used with the UIIcons component. 7. UITabPagesSliding: Another kind of tabbed pages component, with a tab button panel that scrolls horizontally, allowing you to add many buttons, regardless of screen size limitations. 8. Per-Row Renderers and Background Colours for Lists: Apply different item renderers, and different settings to different rows of a list. 9. Better List Scrolling Performance and <renderer> Tag: An easier way to define custom item renderers – that also results in smoother scrolling behaviour. 1o. <model> tag now deals with XML attributes: Previously, the model tag dealt with <this>kind of data</this> not <this attr=”kind of data”/>. So this layout describes a line of icons. LeftMargin defines the start position of the first, and then they are spaced by gapH. iconColour and activeColour describe the colour applied to icons, and how it changes if an icon is pressed. The icons are toggled, so that only one is active at any time. <font> and <activeFont> describe the styling applied to the label in the normal and active states. Note that the background has two values, again for normal and active states. The data is the same as UIIcons. Note that you can get to instances of the UIPages and UIIcons constituents using the .tabPages and .icons getter methods. This new version has tweaked the performance of lists so that they scroll more smoothly. There is also a new, more efficient way to declare common custom renderers. The most common custom renders declare text fields one after another, with an optional image on the left. Up until now – we would have used nested <horizontal> and <vertical> tags to achieve this. But a nested, more complicated, Sprites within Sprites, display-list tree turns out to be less optimal when it comes to scroll performance. Especially, when your list has many renderers made up like this. The new UIRenderer class results in a flatter row renderer. It’s easier, and it performs better. But obviously, the old method is still appropriate for any general renderer layout where <renderer> can’t be applied. The <model> tag has always made it easy to read XML, JSON, or AMF data from a server – and use it to populate a list or form. But previously, the XML capability was limited to reading data between tags. <this>kind of data</this>. Now we can deal with <this attr=”kind of data”/>. … so that’s all the new stuff covered. Please download the Beta, and try it out. Let me know about any problems. Please blog about this project and help to spread the word. Also, don’t forget to leave a “star”, or “g + 1″ recommendation on the Google Code site. The next version of MadComponents/ExtendedMadness will include some significant changes and additions. The beta is available on the MadComponents FaceBook Group to download and try now. (See in pinned thread – the beta is included in the 0.79/0.21 folder). 1. Depreciated Components and New Components: Experimental undocumented, and previously depreciated components have gone. But the ancient UIDataGrid has gone (use UIFastDataGrid), and the ugly UIArrow component is also gone (use <list arrows=”true”>). There are also new components added: UITable, UISpecialDataGrid, UITabPagesSliding, UIScreens, and UIRenderer. 2. Support for Multiple Screen Sizes And Pixel Densities: Use the <screen> tag to specify alternate layouts for different screen sizes. 3. UISpecialDataGrid: A fast and capable Datagrid with images. optimised for mobile devices and GPU rendermode. 4. UITable: Another way of displaying tabular/grid layouts. 5. Icons and Labels For Tabbed Pages: Previously, you needed to do this programmatically using the setTab() method. Now, you can specify labels and images in the layout – and you can even specify multiple versions for different screen pixel densities. So, as there’s so much new stuff – it’s going to take a while to go through the details. So I’m going to split the details between two blog posts. This, and a sequel to follow soon. UIArrow, UIDataGrid, UIDetailList, UIField, UIArrowButton, UIAccordionList, UIPopUpButton, and UITextSlider. Sometimes, ExtendedMadness included experimental trial components that were never formally documented – and it’s mostly those that have been removed here. Be careful that UIArrow is gone now – as some early examples used this. <fastDataGrid> is mostly equivalent to <dataGrid> – so there’s usually no problem replacing <dataGrid> with <fastDataGrid>, and UIDataGrid with UIFastDataGrid. There’s an optional C – which will centre the layout on the screen. Alternatively, specify the minimum pixel density. eg: size=”320DPI”. You would arrange LAYOUT0, LAYOUT1, etc… in order from smallest to largest. With the default specified last. I briefly considered calling this an Advanced Data Grid. But I didn’t want to imply any Flex bloatedness. The UISpecialDataGrid is optimised for performance with GPU rendermode and for mobile devices. UISpecialDataGrid subclasses UIFastDataGrid and adds the ability to incorporate images (or any DisplayObject) inside grid cells. The data for a UISpecialDataGrid starts with the two dimensional array for rows and columns – but any cell that includes more than one item (eg: text + image) will itself be defined as an array. eg: [“Here s my text”, IMAGE_CLASS] or [ IMAGE_CLASS, “Here is my text” ]. There is a restriction, in that you are only allowed ONE text part. But you may use multiple images, both before and after the text. MadComponents has always provided more than one way of constructing tables. Originally, with the old UIDataGrid component – and using a list with a custom renderer and lines=”true” – to construct vertical dividing lines within each row. <rows> and <columns> containers have always allowed you to arrange components into a tabular/grid arrangement – but there are no dividing lines. The new UITable component can be used instead of UIRows – but each cell may have a background and outline colour. In this new version – you may specify them within the XML layout. Also, you can deal with screens with different pixel densities. You can use a size attributes to specify screen dpi, as you would for the <screens> tag. Pixel Densities specified in ascending order, and multiple DATA definitions.